In November, when I told my mom about my plans to cook a month’s worth of meals because I wouldn’t be able to cook, she shook her head. “Pfft. 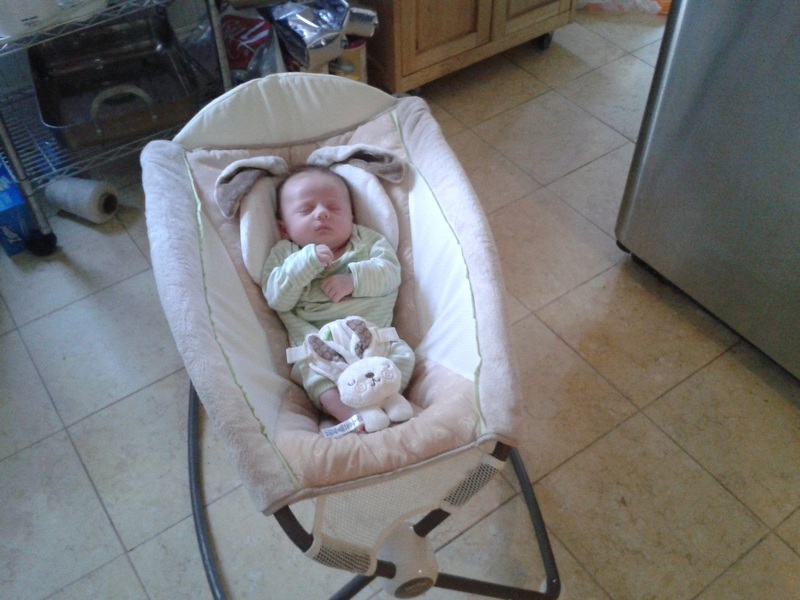 Babies sleep a lot. You’ll see. 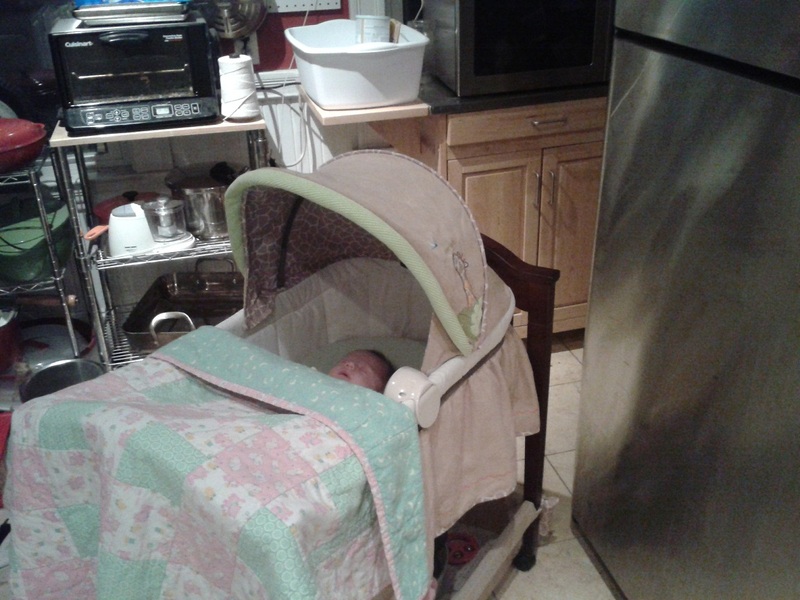 I promise you’ll be in your kitchen just as soon as you’re physically up to it.” Or, as Aleza put it over a porter (hers) and a chocolate banana milkshake (mine), “you’ll just bring the baby into the kitchen.” Well, it turns out that they were totally right: Babies do sleep a lot, and thanks to the generosity of Lilli’s cousins Jack and Ari, she has a swing, chair and bassinet, all of which I have rolled or carried into the kitchen. So, I have been able to cook and I’ve actually started baking bread, too. Tuesdays my mother comes in from Western Mass, and on Fridays my mother-in-law comes in from just north of Boston. Neither ever comes empty-handed, but I’d like to focus on the goods my mother packs. Like Mary Poppins, her bag seems to seem endless and full of perfect little things you didn’t know you wanted until they’re in front of you. And Mom’s not just bringing meals for us, she’s bringing random vegetables that have inspired me to stand in my kitchen and get back into the groove. A gorgeous green pepper found its way into shakshuka. Green beans were steamed and added to a Nicoise salad. Cabbage slaw that I turned Vietnamese. 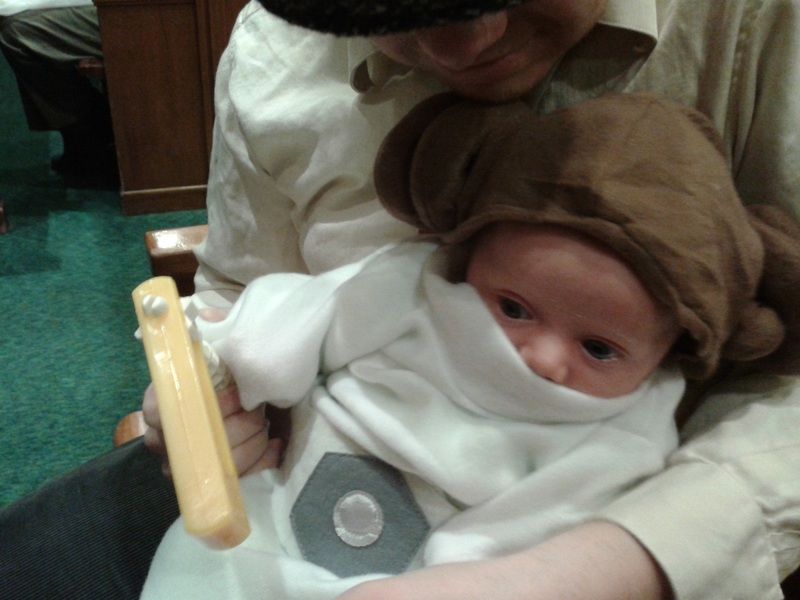 Her Purim costume will fit better by Halloween. Lidia’s recipe calls for about three pounds of fennel; the one Mom brought came out to a little less than a pound once its stalks and fronds were removed. I scaled the recipe to suit the changes in fennel size, but am keeping the recipe here as it stands in her cookbook. It’s a seriously tasty dish. The sweetness of the fennel really works well with the salty capers. Pour the olive oil into the skillet, and set it over medium heat. 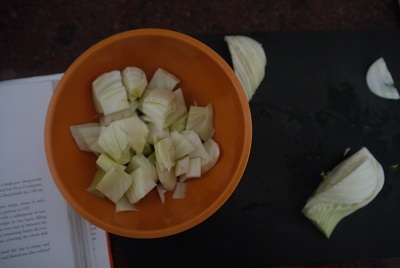 Dump in all the fennel and onions, season with the salt, and stir and toss well. Cover the pan tightly, and let the vegetables cook and caramelize slowly, stirring occasionally. Adjust the heat as necessary so they’re sizzling, softening, and cooking in their own moisture, but not burning or browning too fast. 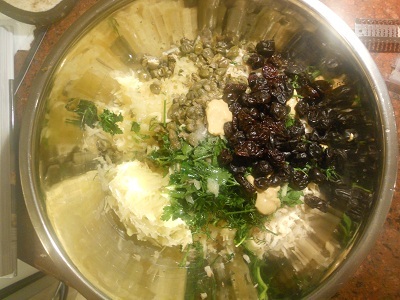 After 15 minutes, stir in the capers; if the fennel pieces appear dry, add a few tablespoons of water too. 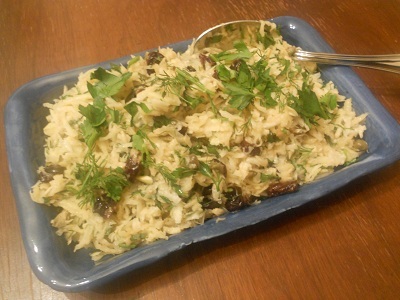 Cook another 15 minutes, tightly covered, stirring now and then, until the fennel is tender and tinged golden brown. If they’re pale, or you want deeper color, cook them uncovered for a few minutes. Taste, and season with salt if you want; grind on pepper to taste just before serving, nice and hot. I know I’m about four years late to the party, but I’ve just discovered Mad Men. I mean, I knew about the show, but hadn’t had the chance to watch it and enjoy not only the storylines (although Season 4 is rather dark) but also the clothing and the sets. And, since I took that Food and the Visual Arts class last fall, I’ve learned to pay close attention to the foods cooked, ordered or, in the case of Don Draper and his co-workers, drunk. My reflux prevents me from posting about my favorite cocktail, so instead I’m going to write about one of my favorite salad ingredients: hearts of palm. Don seems to be a fan of the curious vegetable, ordering it at Sardi’s in Season 2, and Trudy Campbell serves a salad of them to Pete in Season 3. Literally cut from the hearts of palm trees, the vegetable came into vogue as post-war Americans became more affluent and more adventurous in their eating (think Polynesian/Chinese food). Hearts of palm and I have a bit of a history. 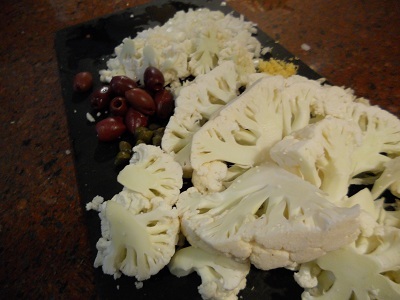 About 10 years ago, Sylvie and I went on a bit of a hearts of palm binge. (Side note: How is it possible I only started talking about Syl a month ago? Clearly we spend a great deal of our time together talking about food.) We had gone through all the hearts of palm my mom had purchased for Passover, but we wanted more. 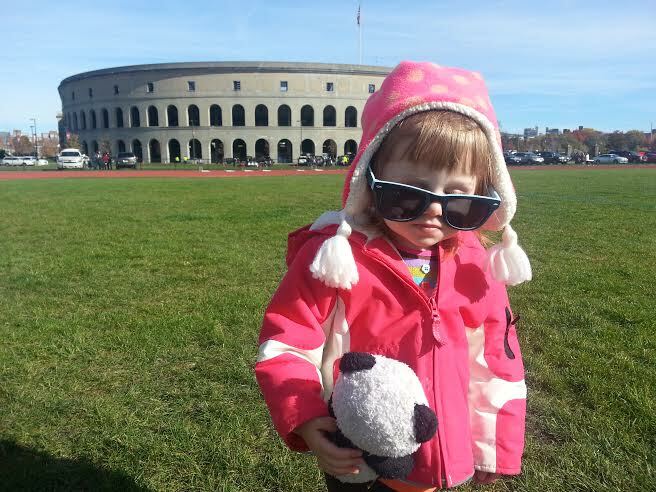 We scoured the shelves at the Big Y in the center of town, and even tracked down the manager. He had never heard of the vegetable, but assured us he would order a case. 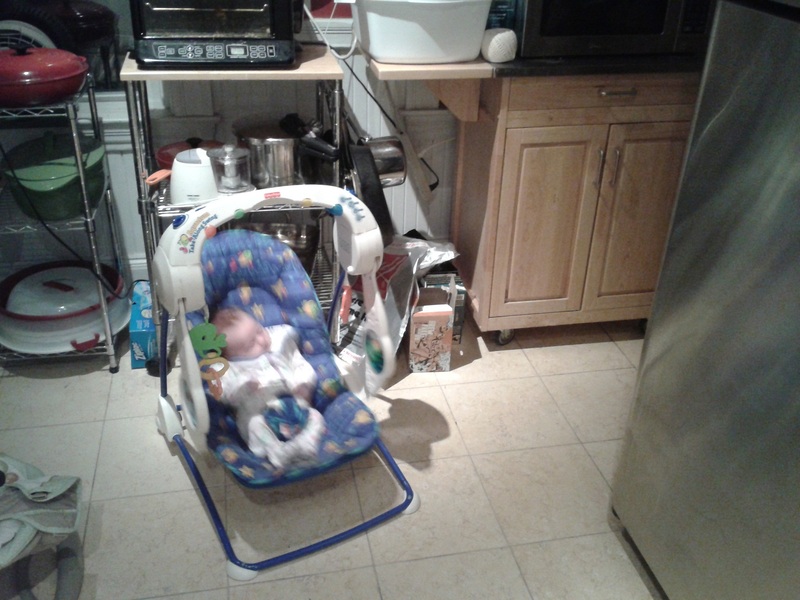 A few weeks later we got the call: our hearts of palm had arrived, an entire case of them. It turned out the manager ordered a case for the store, and an entire case just for us. We stood there for a second, and then nodded together, in that way that siblings are able to have entire discussions with each other without saying a word, said thank you, and went home with our bounty. 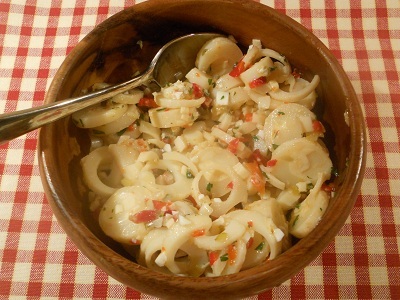 Now, this “Sardi’s Hearts of Palm Salad” is a pantry recipe for me. Granted, it’s kind of ridiculous I have pimentos on hand, and if you don’t, I would suggest opening a jar of roasted red peppers and adding them to the vinegar-onion mixture as you chop the rest of the dressing ingredients. In the course of making this salad I also discovered I have three separate jars of capers in the fridge, but as I’ve mentioned in the past, I have a predilection for pickled things. I minced the onions and added them to the vinegar before I chopped anything else so they’d have less of a bite by the time the salad was ready to be served. I’ve ignored the recipe’s instructions regarding the lettuce leaves and sprigs of watercress because I am far less likely to have those items reliably in the fridge. 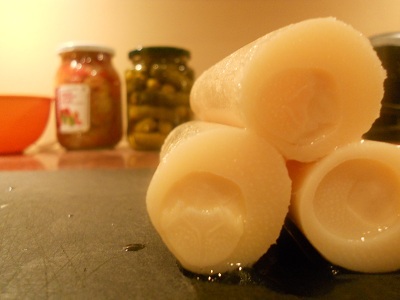 For those nervous about using canned hearts of palm, they can also be found in glass jars. Quick tip for hard-boiling the eggs: I take a note from Alton Brown for this one, and cook my eggs in my plug-in kettle I keep on the counter (or kum-kum for those reading this in Israel). After the kettle boils and pops, let them rest in the pot for 10 minutes, and you’ll have perfectly boiled eggs. 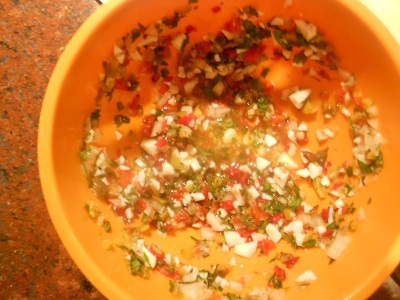 Place the finely chopped onion in a small bowl and add the vinegar. Chop the rest of the ingredients and add them to the small bowl. Sprinkle with salt and add the olive oil, Stir thoroughly. Keep in refrigerator. Always stir before using. Slice the hearts of palm into ¼ inch round slices. Place in a serving bowl. Stir in two tablespoons of the vinaigrette. Taste and add more dressing if necessary. 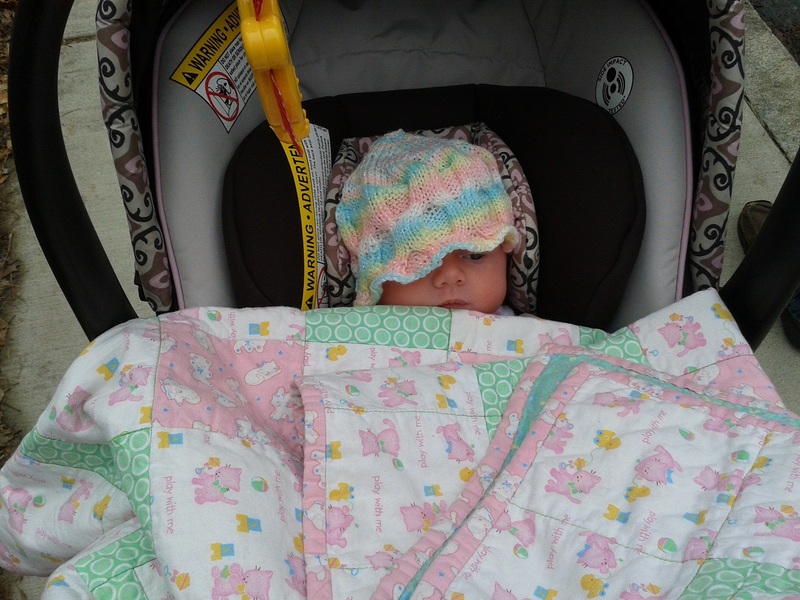 This past June, on the way to my cousin’s baby shower, I got lost. Really, really lost. Like, call my parents on a Sunday morning slightly hysterical lost. Like, call Rich the morning after a bachelor party while he’s eating at IHOP lost. The worst part was I had a GPS, but the road I would have normally taken was being worked on, and every time I turned on the GPS to lead me north, it directed me back to the closed-off highway. By some miracle, I made it to the shower on-time, although I now know that GPS and cellphone reception between Lowell, MA, and southern New Hampshire is a bit spotty in places. The silver lining to the story is that while I was in the car, NPR’s Weekend Edition introduced me to Yotam Ottolenghi, an Israeli-born chef now working in London, whose new vegetarian cookbook, Plenty, has become a smash hit this year. Vegetarian and Israeli — basically, a cookbook written for me. My friend Sara tells me that when she lived in London in 2005 she went to his restaurant all the time, but was always surprised that he had so little name recognition in the States. 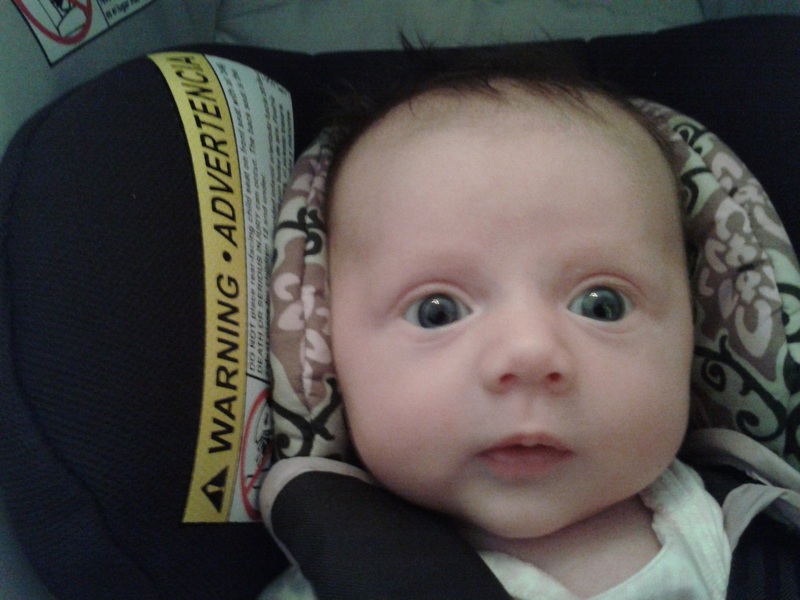 As soon as I made it back from the shower, I put my name on the waiting list at the library. There were about two dozen people ahead of me, and as his recipes started popping up on blogs I read, I needed to remind myself that patience is a virtue. Last week, I received the notice that the book was waiting for me at my local branch around the corner. I was so excited. It was my turn, finally. Mine, mine, mine. Except, not unlike the GPS debacle, the book the librarian handed me wasn’t Plenty, but his first cookbook, Ottolenghi: The Cookbook, written in 2008. Well, I told myself, a top chef still has top recipes, even if they aren’t the ones I was counting on. So I decided to make lemonade out of lemons — or, in Ottolenghi’s case, preserved lemons — and dove in. It’s always interesting reading a cookbook from another country because it’s a reminder that there’s a whole lot of world outside of my home. I knew that courgettes were zucchini and aubergines were eggplants, but I had no idea that snow peas were called mangetout, or that I actually had a swede — aka a yellow turnip, aka a rutabaga — in my crisper. 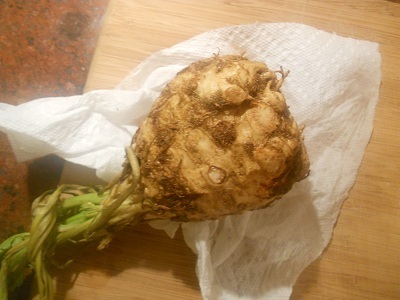 I also had celeriac, (celery root) in the house as well, a cast-off from my officemate’s CSA. The recipe I have for you today, a celery root and rutabaga slaw, is just perfect for these late autumn/almost winter months, and makes me wish these veggies were year-round produce. 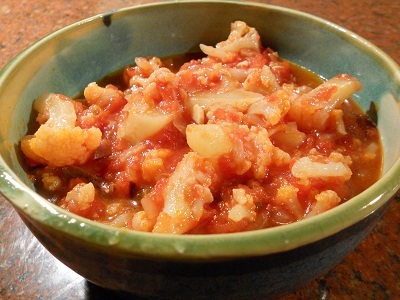 I’d never considered eating rutabaga raw, as I usually roast or braise them. And boy, have I been missing out! Seriously, the dish is extraordinary. Rich said it was one of the better things I’ve made lately. Not that I’ve been serving him swill; it’s just a really amazing salad. It is a bit like a rémoulade in its tang, but also has multilayered sweet (dried cherries) and savoury (capers) flavours to create a magnificently intense accompaniment to fish or lamb. It will also make a great addition to a vegetarian mezze. Variations on this dish are endless. Try using kohlrabi, beetroot, turnip, carrot or cabbage, or a combination of them for this salad. Most soft herbs would suit, and don’t forget the acidity from citrus juice or vinegar to lighten it up. I always have capers in the house, and I keep dried cherries from Ocean State Job Lot on hand in the pantry at all times, making this a great pantry recipe. I’ve made this dish twice in a five day period, and that’s without my large food processor. 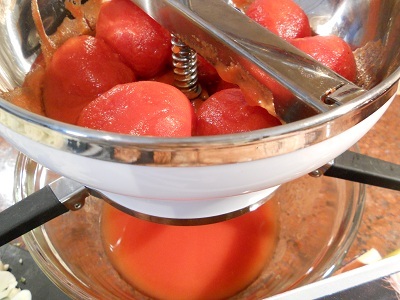 If you do have a food processor, this whips up in a jiff; if you don’t, I promise you it’s worth the extra effort. I didn’t have any sunflower oil on hand, so I used olive oil exclusively for the salad. I also used regular sugar in lieu of caster sugar. The slaw was still wonderful. Don’t be scared of the ugly celery root. Give it a rinse to get some of the dirt off, and stand it up on the cutting board and cut the skin off by slicing down the sides of the bulb with a large sharp knife. 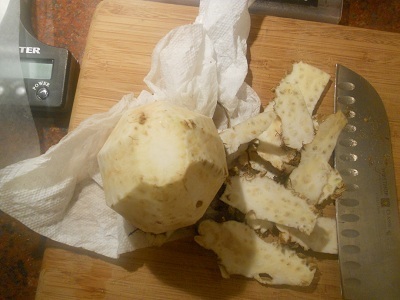 You can cut the waxy skin off the rutabaga in the same manner. The recipe is in grams, so my digital scale got quite the workout this week. I’ve converted it into ounces and cups for a more Continental-friendly audience, but the grams are the original measure and most accurate. 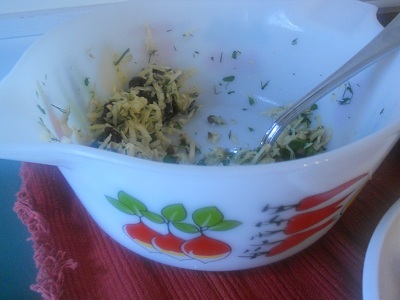 Place the shredded celeriac and swede in a mixing bowl. Add all the rest of the ingredients and use your hands to mix everything together thoroughly. ‘Massaging’ the vegetables a little will help them absorb the flavors. Taste and add salt and pepper to your liking You might also want to add some extra sugar and vinegar. Allow the salad to sit for an hour so the flavors can evolve. It will keep for up to 2 days in the fridge. Add more herbs just before serving, for a fresher look.